President Trump, in an apparent warning to his fired FBI director, said Friday that James Comey had better hope there are no "tapes" of their conversations. Trump's tweet came the morning after he asserted Comey had told him three times that he wasn't under FBI investigation. "I said, 'If it's possible, would you let me know, am I under investigation?' He said you are not under investigation," Trump said in an interview Thursday with NBC News. He said the discussions happened in two phone calls and at a dinner in which Comey was asking to keep his job. Comey has not confirmed Trump's account. Late Thursday, The New York Times cited two unnamed Comey associates who recounted his version of a January dinner with the president in which Trump asked for a pledge of loyalty. Comey declined, instead offering "honest(y)." When Trump then pressed for "honest loyalty," Comey told him, "You will have that," the associates said. White House spokesperson Sarah Huckabee Sanders disputed the report and said the president would "never even suggest the expectation of personal loyalty." Officials did not immediately respond to questions about whether Trump recorded his discussions with the FBI director. The president's morning Twitter comments again raised the specter of Richard Nixon, who secretly taped conversations and telephone calls in the White House during the Watergate investigation that ultimately led to his downfall. Trump's firing of Comey already has left him with the dubious distinction of being the first president since Nixon to fire a law enforcement official overseeing an investigation tied to the White House. Even before Trump's provocative tweet, the White House was scrambling to clarify why Comey was fired. Trump told NBC he had planned to fire Comey all along, regardless of whether top Justice Department officials recommended the stunning step. The White House initially cited a Justice Department memo criticizing Comey's handling of last year's investigation into Hillary Clinton's emails as the impetus for Trump's decision. But Trump on Thursday acknowledged for the first time that the Russia investigation — which he dismissed as a "made-up story" — was also on his mind as he ousted the man overseeing the probe. The shifting accounts of the decision to fire Comey, whom Trump derided as a "showboat" and "grandstander," added to a mounting sense of uncertainty and chaos in the West Wing, as aides scrambled to get their stories straight and appease an angry president. Not even Vice President Mike Pence was spared the embarrassment of having told a version of events that was later discredited by Trump. The White House's explanations continued to crumble throughout the day Thursday. On Capitol Hill, acting FBI Director Andrew McCabe strongly disputed the White House's assertion that Comey had been fired in part because he had lost the confidence of the FBI's rank-and-file. "That is not accurate," McCabe said. "Director Comey enjoyed broad support within the FBI and still does to this day." Unfazed, Sanders insisted she had heard from "countless" members of the FBI who welcomed the president's decision. McCabe also pointed out the remarkable nature of Trump's version of his conversations with Comey. McCabe told a Senate panel it was not "standard practice" to tell an individual whether they are or are not under investigation. Previous presidents have made a public show of staying out of legal matters, so as not to appear to be injecting politics. Trump's comments demonstrated his striking deviation from that practice. The ousted director himself is said to be confident that his own version of events will come out, possibly in an appearance before Congress, according to an associate who has been in touch with him since his firing Tuesday. 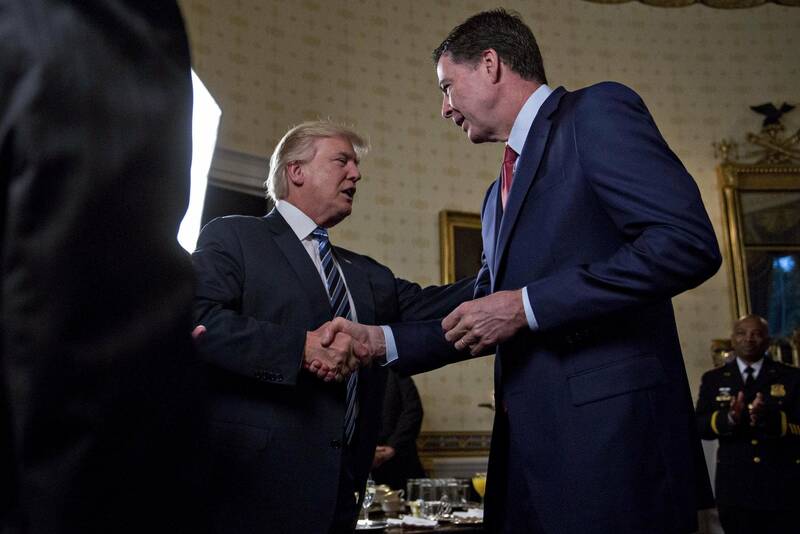 Trump and Comey's relationship was strained early on, in part because of the president's explosive and unsubstantiated claims that Barack Obama wiretapped Trump Tower. Comey found the allegations confounding, according to his associate, and wondered what to make of what he described as strange thoughts coming from his new boss. The president was no kinder to Comey on Thursday, calling him names and saying he'd left the FBI in "virtual turmoil." He said that while he received a scathing assessment of Comey's performance from Deputy Attorney General Rod Rosenstein on Monday, that memo was not a catalyst for his dramatic decision as the White House had said earlier. "I was going to fire Comey," Trump said. "Regardless of recommendation I was going to fire Comey." That's far different that the White House's initial account in the hours after Comey's firing. Multiple officials, including Pence, said the president was acting at the behest of Rosenstein and Attorney General Jeff Sessions. But it quickly became clear that the president had been stewing for days over the Russia investigation and Comey's refusal to defend him in appearances before lawmakers. By Wednesday afternoon, the officials, like Trump, were saying he had in fact been considering ousting the FBI director for months because of a lack of confidence in his ability to lead the agency. And the Russia investigation was still on his mind. "In fact when I decided to just do it, I said to myself, I said you know, this Russia thing with Trump and Russia is a made-up story, it's an excuse by the Democrats for having lost an election that they should have won," he said. Sanders attributed the disconnect in the week's explanations to the fact that she had not directly asked Trump when he'd made the decision to fire Comey until shortly before Thursday's press briefing. White House officials and others insisted on anonymity in order to disclose private conversations and internal deliberations. The White House said Trump is weighing options for replacing Comey, a decision that could have broad implications for the future of the Russia investigation. Some senior officials have discussed nominating Rep. Trey Gowdy, the South Carolina Republican who ran the House committee that investigated Secretary of State Hillary Clinton's actions in connection with the 2012 attack on a U.S. compound in Benghazi, Libya. Trump's advisers have repeatedly tried to downplay the Russia-election matter, with Sanders saying Wednesday the FBI was "doing a whole lot more than the Russia investigation." But McCabe characterized the investigation as "highly significant" and assured senators that Comey's firing would not hinder it. He promised he would tolerate no interference from the White House and would not provide the administration with updates on its progress. "You cannot stop the men and women of the FBI from doing the right thing," he declared. He said there has been no interference so far.